why somebody sees a councillor should only be the business of that person alone and nobody else. People have often asked me about whether I’d consider getting back my sight but why miss something you haven’t got particularly when you know no different? and there are those of us who don’t ever like to talk about our problems and also that’s our business not anybody else’s. by all means they can suggest but don’t push or patronise us in the process. I agree ! It is someone’s choice if they talk about their problems. It is also patronizing when people think the only problem you could possibly have is blindness. Thanks for reading !! what I forgot to say was that we all have our own struggles no two people deal with their struggles in the same way and that is correct making assumsions doesn’t get us anywhere nor is it ever appropriate to trivialise somebody’s struggles nor minimise what somebody is dealing with. it’s easier said than done to say move on each to their own though. Yes I agree trivializing what someone is going through never gets us anywhere. If I am having a bad day and am frustrated with my blindness that is ok and it is ok for anyone to have their own struggles and deal with them in their own way. Some sighted people are so stupid aren’t they? I think they just don’t know. It is something that is so foreign to them that they just can’t fathom being blind. 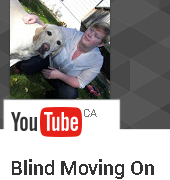 I like to hope that if they knew more about blindness things would be different.